MONTREAL, QC--(Marketwired - Mar 24, 2014) - Head to this conveniently located Montreal-area airport hotel for unforgettable savings on your next family vacation. For the entire month of April, the Courtyard Marriott Airport hotel is offering a spectacular promotion for families. This special package is available on weekends and includes a half-dozen homemade cookies, a hot buffet breakfast for two adults and up to two children, age 12 or under; choose either one regular size room with a king-size bed and a pullout couch or a regular room with two queen beds. Whichever you choose, it's fun -- and incredible savings -- for the whole family. Rates start $129. There's plenty to keep the whole family occupied at this hotel near the Montreal airport, including a movie theater, a shopping mall, multiple dining options, a mini golf course, and an arcade all just a few steps away. And of course all the attractions of Montreal itself are just a short distance away. 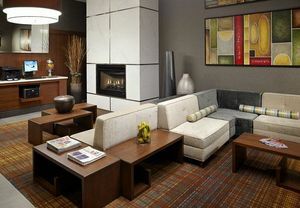 When the family is ready to relax, the Courtyard Montreal Airport guest rooms offer all the comforts of home -- and more. All of the luxurious rooms have cable TVs and per-per-view movies, and the entire family will love the hotel's indoor pool and hot tub. Active guests can get a great workout in the spacious, fully outfitted gym. When it comes to dining, there are options galore: room service is available for breakfast and dinner, or choose from a full range of restaurants within walking distance. This Montreal-area airport hotel is a top choice for business and leisure travelers, and the knowledgeable staff and comfortable guest rooms will make your visit easy and enjoyable. All guest rooms have luxurious bedding and each room is equipped with cable TV and pay-per-view programming, a mini fridge, and a coffee maker with tea service. All have ample room for relaxation or work. Hotel amenities include a business center as well as an indoor pool, whirlpool, and fitness center. From Monday to Friday, the YUL Restaurant & Bar is open for breakfast, lunch, and dinner, serving fine French cuisine, and the YUL Bar Lounge is also an option for dinner and drinks in the evening. Wireless Internet is available throughout the hotel, in the lobby, public areas, and guest rooms. The entire hotel is nonsmoking and there is complimentary overnight parking. Nearby attractions for the whole family include La Ronde amusement park, the Cosmodome Space Science Center, and the Montreal Planetarium, as well as Montreal's fabulous restaurants, vibrant nightlife, and chic boutiques, all of which make the Courtyard Montreal Airport hotel ideal for family vacations, business meetings or just a relaxing getaway. Head to this conveniently located Montreal-area airport hotel for unforgettable savings on your next family vacation. For the entire month of April, the Courtyard Marriott Airport hotel is offering a spectacular promotion for families. This special package is available on weekends and includes a half-dozen homemade cookies, a hot buffet breakfast for two adults and up to two children.